Looking back at his long prolific career spanning more than 5 decades, it’s quite evident that Nayyar Ali Dada knows his poetry. The poetry of space, the poetry of expression and the poetry of interpreting the spirit of the times into built form. Through this extraordinary gift, Dada has gained cultural primacy and has cemented his place as one of Pakistan’s greatest architects. Belonging to the second generation of Pakistani architects, Dada enrolled into the National College of Arts which in the 60’s was a portal of modernist and progressive ideas under the direction of the then Principal, the great artist Prof. Shakir Ali. It was in this intellectual and artistic environment where the young Dada’s aesthetics were strengthened and refined giving way to his modernist design sensibilities. Dada has always been a modernist at heart though his style has evolved from that to a regional modernist with a strong sense of the context and an endeavour to discover the identity of Pakistani Architecture through his designs. Starting his career with mainly residential projects, it was not until the Rivaz Garden Flats, a project of low cost apartment blocks that Dada started experimenting with brick, which would later become a trademark in his buildings. Two of his most memorable works early on in his career were a gift to his alma mater –the new Studio Block (which now houses the Fine Arts Department) and the Shakir Ali Auditorium at the National College of Arts. The brutalist Auditorium with its grand concrete staircase embodies a distinct plastic quality which makes it blend-in amongst its neighbouring colonial buildings yet stand on its own making it one of the most defining spaces on the campus. By the late 70s, Nayyar Ali Dada had made a prominent name for himself but it was a project that he secured from the Lahore Arts Council which would eventually put him on the world map. The world-wide recognition and the success of the Alhamra Arts Council brought in more public works on a mega scale for Dada especially in his hometown, Lahore where he redefined the language of architecture in the city with his emblem of native red brick buildings. In 1993, he was appointed to design the Alhamra open-air theatre for large cultural activities. Reminiscent of a Greek amphitheatre, the reinforced concrete arena featured hand-made brick cladded with decorative ceramic tile courses running throughout the façade. The project was later extended to the renovation and extension of the Gaddafi Stadium nearby for the 1996 World Cup which again introduced traditional motifs of exposed red brick to a modern form. The style had by now become quintessentially Dada who had been delving into the identity of Pakistani architecture without being bogged down by the styles of the past but at the same time being sensitive to the local context and the built heritage. This was followed by recurrent large scale projects, including office complexes and regional head offices in the late 90s and 2000s namely the HBL Regional Office on the Mall and the MCB House on Jail Road –both buildings successfully reflecting the ethos and visions of the client and becoming an esteemed symbol of the city. Throughout his works, Dada has always paid tribute to his one true love, Lahore. Though the homage does not restrict to new works only, he has also been involved in the conservation of historic buildings like the Quaid-e-Azam Library, the Freemasons Building and many more giving equal importance to its heritage as he does to the built language of the present-day. 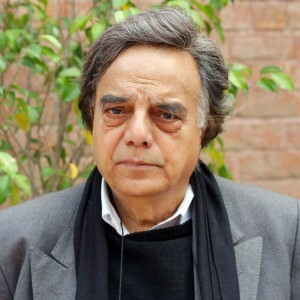 Nayyar Ali Dada is the pride of the country, a star architect and maestro who’s architecture is synonymous with iconic designs and some recent projects include Lahore’s Expo Centre, completed in 2010 which was another chance to delve into the character of the city and define it through his designs. Another one, The Grand Jamia Masjid of Bahria Town which has rose to become the 7th largest mosque in the world. 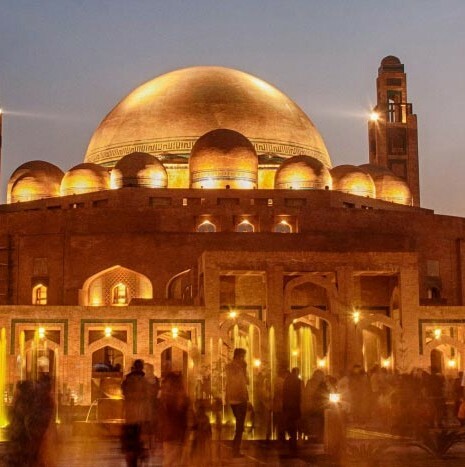 The elegant design of the Mosque is the perfect blend of Islamic traditions with a quintessentially Pakistani Identity. Frank Lloyd Wright once said ‘The mother art is architecture. Without an architecture of our own we have no soul of our own civilization.’ And indeed throughout his prosperous career, Nayyar Ali Dada has strived to unearth Pakistan’s true architectural vocabulary that echoes the present cultural zeitgeist — just like the Mughals and the British had, before us—in turn, defining the very soul of our civilization. At 75, Dada is still unstoppable and a force to be reckoned with. Nayyar Ali Dada received the Pride of Performance Award by the Government of Pakistan in 1992.